The new Novel The Butterfly Effect will be ready soon for publication. But it needs it’s final spit and polish, and this means completely re-writing to add in the ‘colour’. I’ve just been on a ‘research tour’ and this is where I went. I am sitting in a quiet little nook in the foyer of the Moonview hotel in HANOI. When we first came to this hotel it was called Bro and Sis, but in the past two years the hotel has been upgraded. Upstairs on the 12th floor there is a neat and tidy breakfasting room which serves as a small restaurant in the evenings. Set off from this is a well stocked small bar where you can drink beer, wine and spirits and even smoke a cigarette if you wish. What a pity I am now in my retirement years! Thirty years ago I would have been in a lolly shop. The girls are so pretty! I have been to many countries in my 66 years, but honestly I can’t remember a place where the people were so sweet, so honest, and (in the case of the girls, so positively gorgeous.) Perhaps this is the same for boys, but as a male I am not qualified to say. What I can say though is that the boys are smiling and polite, and my old experienced eye tells me that Hanoi boys have a love and respect for girls that might just attract any western girl to their charms. Well if that sounds sexist I know it does but I see it just as being a male in this complex culture we live in. 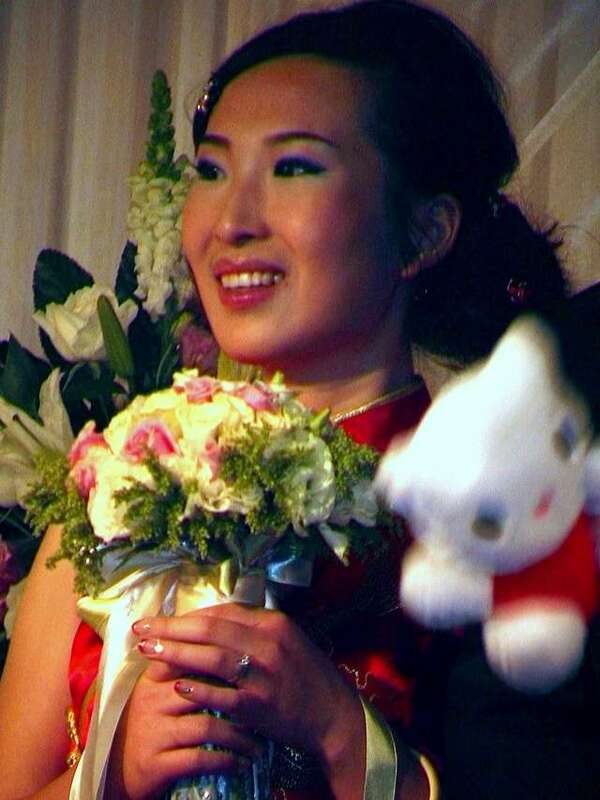 Girls still fascinate me, and in Vietnam the climate has given the girls and the boys alike those clear soft skins and features the seem to have been created by a group of Gods working together. Taking a taxi to the WESTGATE DENTAL CLINIC where we were booked in for dental work (taxi fare $2.95 from the hotel), scooters, low-powered motor bikes and electric bicycles appeared like a great swarm of angry bees. Car drivers beware. It is not the bike riders in this city who have to be careful. The cars are the minority and car drivers are not regarded as significant in the scheme of things. So, drive slowly with your foot close to the brake pedal and be sure to keep your eye open for errant bike riders crossing your path. The riders, looking like kung-fu bandits with their faces covered with bandanas to keep the choking air from their sensitive nostrils. Everywhere there is food. Food being eaten, cooked, chopped, sliced, and traded. Everything seems to operate through food. 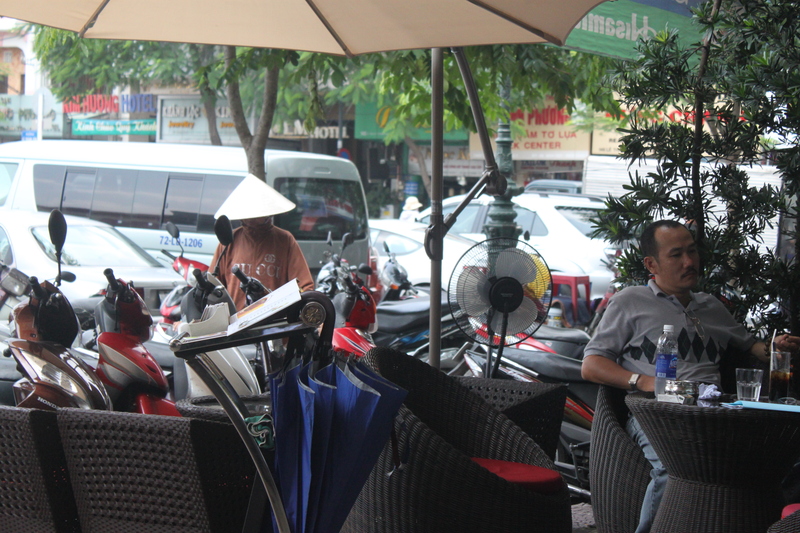 You could also be forgiven for thinking that Vietnam holds the record for coffee houses. They are everywhere, and they are so good! First impressions: Coming from the airport at 10pm we had to rely on trust to negotiate the price of the taxi when we reached our destination. No need to worry. The doors to the Moonview swung open and the doorman, (pleasant young man) inspected the taxi meter and declared that the fare would be a little over 300,000 dong. Shock turned to pleasant surprise when this huge sum of money turned out to be a little over $15 US. Similarly the trip to the WESTGATE DENTAL CLINIC some 3.5km away was just 59,000 dong., ($2.95). It takes a long time getting used to all those zeros on the currency. 20,000 dong is $1 and 21,000 dong will buy you a packet of cigarettes. We had been in Shanghai for a week to visit our adopted girls and their babies. After 8 years of visiting China, this trip was a disenchantment. The China we had grown to love over the years of openness had changed subtly and not for the better. Where once we had been able in the hotels which catered for “foreigners” to log into facebook or our social networking sites, we were no longer able to. China has grown exponentially, but with the greater freedoms of consumption, the Chinese people have not noticed the door closing quietly on their contact with the outside world. In China news is the news the government want. Sadly it seems that there is much trumpeting about how wonderful the Chinese have managed their economy, and how much better off the Chinese people are. And now Michelle is pregnant for the second time. She could have a quick and legal abortion and she feels inclined. Apparently the burden of two children under three is going to prove super stressful and fatiguing. I told her she’s lucky that she and Jason can have two children. (They get one each is they are only children themselves, so both Jason and Michelle qualify.) Modern Chinese youth is contributing shamelessly to the philosophy of hedonism. So long as they don’t question the government ,living is getting easier. There is now an arrogance in China that once did not exist. Or it existed hidden from Western eyes. Now they build cities that few will ever live in just to spend the money overflowing from the government purses. Arriving in Hanoi was a new breath of fresh air. Every place we go to has fast wifi, there is an abundance of fabulous coffee shops, and the pastries, breads, and cakes are to die for! This is a place that was taught to bake bread and pastries by the French during the colonisation of Vietnam and this art has been taken to mouth watering limits. In fact, if you can’t find a decent eating place among the thousands and thousands of establishments, you probably live on dry bread and water! 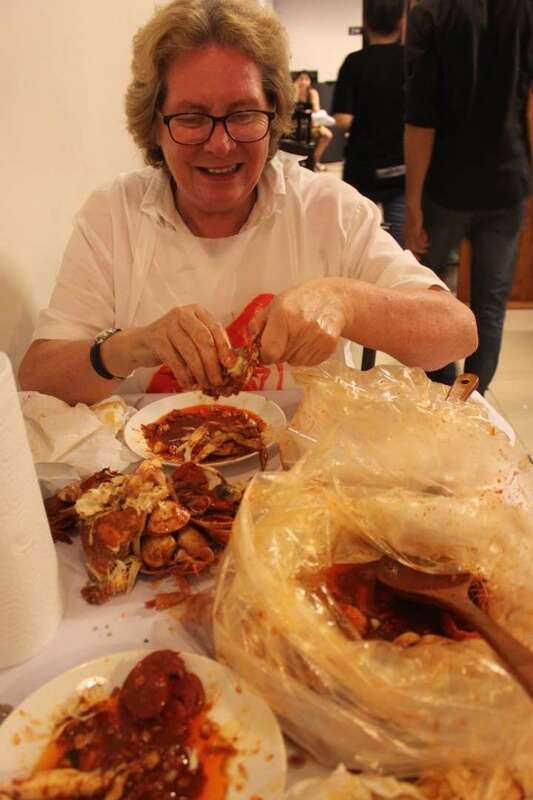 Eating in Vietnam is quite unlike China, (where the food is magnificent, but you go to a restaurant to eat and run). In Vietnam you have time to linger over your food, sit back and drink copious quantities of Hanoi Beer (or your choice of hundreds of different brands) and you don’t feel uncomfortable spending time. No one looks at you as if you are taking up another paying customer’s seat. Besides, there is nothing nicer, even at this writer’s advanced age, sitting watching the girls go by! Oh to be young again. Walking around Hanoi, my camera constantly demanded to be at eye level. Slim buildings slotted into impossible areas of land, with extravagant fascias cried out to be snapped. Every picture seeming to be a work of the artistic eye, where, in fact, the composition created itself. Point your camera, and press the button. So long as you have a decent exposure and focus, the result is a pleasing work of art that will make any amateur snapper look good. 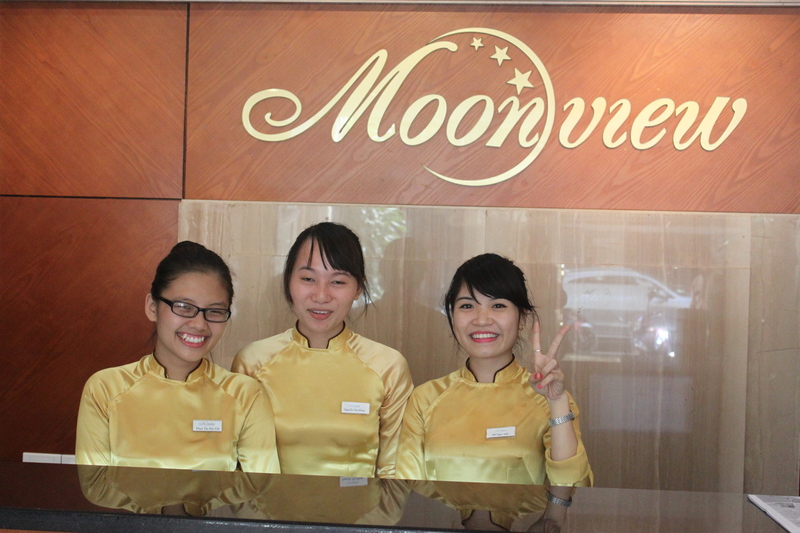 Our location at the Moonview Hotel made it possible to visit some essential locations. Everyone who comes here should visit the Presidential Palace. Quiet walkways, lined with shady trees take you away from the frantic hustle of pavement cafes and the mass of scooters that seem to be everywhere in the city. Walking across the wide parade ground and being able to take pictures of the fabulous architecture is a pleasant break. 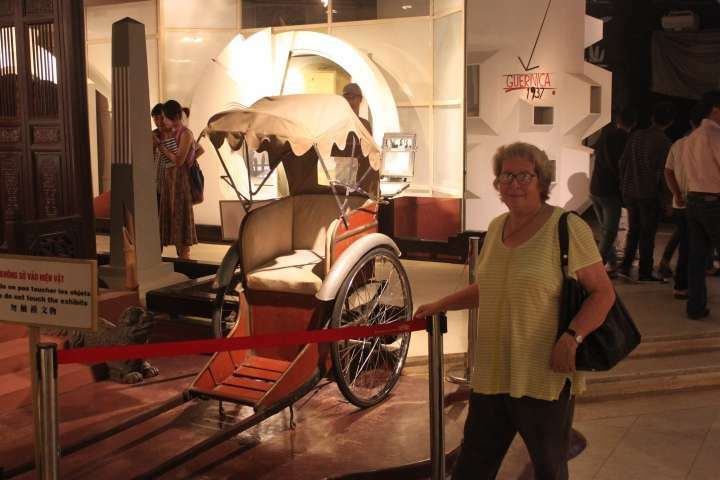 Visitors must take some time to visit the museum where you will get an idea of the history of the struggle of Vietnam to become what it is now; an independent, free, bustling country where people can feel safe and life the lives they always longed for. 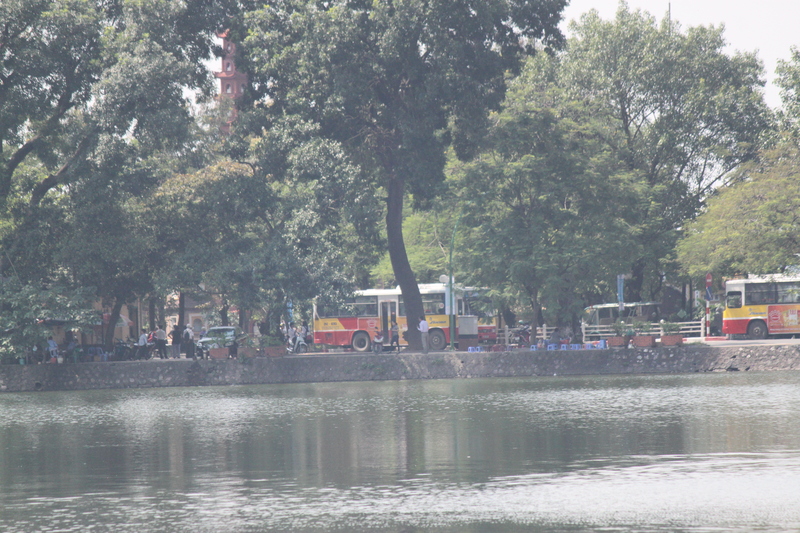 There are several lakes in Hanoi which locals spend time at fishing, eating in the huge range of cafes and restaurants and just sitting watching the world go around. This is a laid back culture where people smile a lot, and there is a constant feeling of safety. Vietnam has has a lot of growing to do yet, and if you come here to visit and to enjoy the magnificent views and lifestyle you will be getting the very best of the young and vibrant land. I’m in love with Hanoi. With the cafes, the restaurants, the girls, and the many places to visit. Things to do: One must, is to visit the art galleries. Vietnamese artists are rising on the world stage and their work would hang on any wall. Right now prices are as low as they will ever be and wise investment will pay dividends. Food: Foodies will find Vietnam an absolute delight. Bread and pastries, coffee ,and the delicate tastes of Asia will not mess with the waistline. There are not many fat people here. In fact, the people are what my partner calls ‘walking clothes horses’. Some things to avoid: Every now and then you will be caught out by rogue taxis. They my look like legitimate taxis, but the giveawayis that they do not have the driver’s ID in the front of the cab. To all intents and purposes the rogue cabs look the same as the legal ones except for this one thing. Check, or be prepared to pay the cost. It’s no shame to get caught out. This happened to us one day, but after being caught out just once, we began to rely on the hotel staff to ensure that we took the right one from the Hotel, and whenever we needed to get back we were able to identify the good guys. Everyone gets caught. Fortunately the sums are not large and you might feel that the cost of a taxi in New York or London is similar. 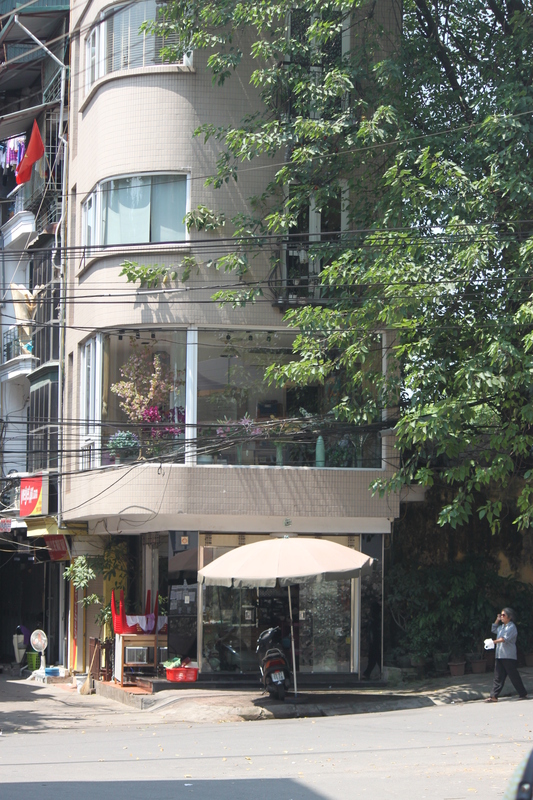 Have fun in Hanoi and look for my blog on Ho Chi Minh City.